Having launched last November, Russia’s Match TV over-the-air public sports channel may be a rookie when it comes to an Olympic Games, its production team of 130 people has managed to overcome a number of obstacles to deliver coverage that has more than satisfied Borislav Volodin, COO/head of Olympics production, Match TV. Match TV’s Borislav Volodin says the channel’s first Olympics operation has been a success both in Rio and back home in Russia. Although the Match TV team is ready to cross the finish line today, only a few weeks ago, the team didn’t even know if there would be a marathon to run: the Russian team was at the mercy of the IOC as to whether any of the athletes would even be here. Disciplinary action related to a doping scandal threatened to keep the entire Russian Olympic team home, and Match TV already had equipment on the way to Rio and travel and production plans set. That success on the field of play and the presence of the majority of the Russian athletes have made a difference back home as well. 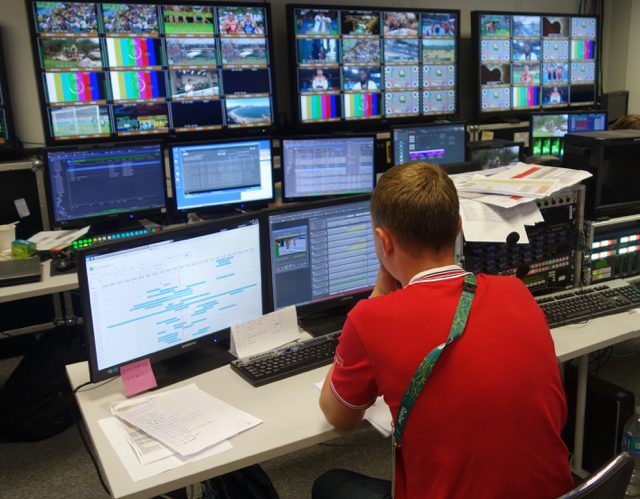 The Match TV production team is working out of a 400-sq.-meter space in the Olympic IBC, making the most of tight quarters and producing five channels of coverage for Russian viewers. 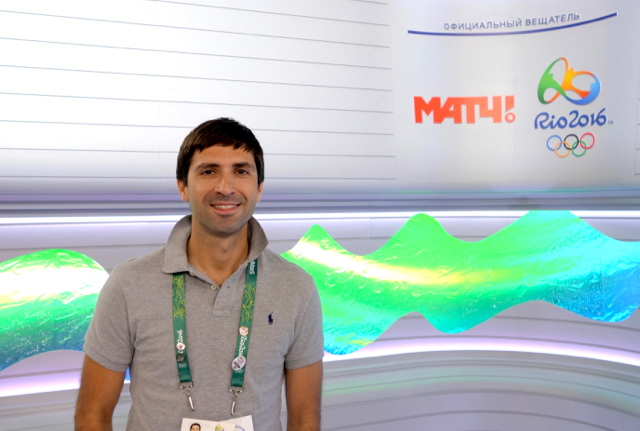 Four pay-TV channels offer scheduled live coverage of events of interest to Russian viewers, and the main Match TV channel makes use of a studio located within the IBC. Russia’s Match TV brought more than 21 tons of equipment and 130 people to Rio for the Olympics production. Like many of the broadcasters at the Olympics, Match TV is making use of TVU Networks bonded-cellular transmission technology. Seven news correspondents are roaming the Rio area providing live updates from various events (the network also has 11 mixed-zone positions), and the TVU technology removes the need for costly SNG equipment. The backbone of the network’s production is the OBS VandA package of 55 feeds with audio and video. The channel has 21 commentary positions at venues and also five off-tube studios in the IBC in case the commentators cannot get out to the venue. The 130 people onsite are making use of 21 tons of equipment shipped over from Russia. All of it is owned by Match TV, and Volodin says it was a challenge for the engineering team to make everything fit into such relatively tight quarters. The facilities include one main control room for the Match TV channel and four smaller control rooms for the pay-TV channels. The VandA package allows the production teams access to the camera feeds that cover the Russian athletes that are most important to viewers back home. One piece of unique technology the team is using is Media Office, a Unix-based asset-management system created for the 2014 Sochi Olympics. It allows editors and producers to search for material that might be related to an event or athlete. Also on hand are seven Avid editing systems for creating highlights and feature stories.